"She's so alive in the scenes and the craziest part is how not crazy it feels. Princess Leia lives in this film in a way that's kind of mind-blowing for me." Kathleen Kennedy, the president of Lucasfilm - a subsidiary of Disney that makes the Star Wars films - agreed with the event's panel host Stephen Colbert it was "unprecedented" to tell a story in a nine-film arc. "What's also fascinating is it's over 40 years," she told the event. "To keep this relevant and meaningful to the characters and to the people experiencing this story, it has to feel like its of its time. "We've taken to heart everything that inspired George [Lucas] and then I think the inspiration that JJ's [Abrams] brought to this has given it even more depth." The movie also features the return of John Boyega as Finn, and Oscar Isaac's Poe Dameron. 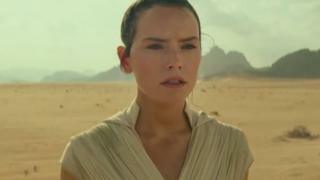 The trailer opens with Rey on a desert planet as Skywalker, played by Mark Hamill, says in a voiceover: "We've passed on all we know. A thousand generations live in you now. But this is your fight." Lando Calrissian appears at the controls of the Millennium Falcon, putting it into hyperdrive as a title card says: "The saga comes to an end."